If you run into prickly poppy, you'll understand the name. ﻿﻿﻿﻿﻿﻿﻿﻿Some wildflowers are aptly named. The white prickly poppy (Argemone albiflora) looks just like it sounds. The flower is typical of the poppy family: symmetrical and cup-shaped, with four to six crinkly, fluttery petals. A crowd of bright yellow stamens surrounds a central pistil topped by a purple style. Fully open, the flower can be up to four inches across. It looks a lot like the red poppies of Belgium and France, except that its petals are pure white. Underneath that pretty bloom is a very prickly plant. Leaves are deeply lobed with sharp tips on every point. Stems are studded with short, fierce spines. A typical specimen stands about three feet, sometimes taller, anchored by a taproot and branching near the top. Seed pods are one to two inches long, rounded at one end with three horn-like projections at the other. The pods, too, are armed with spines. 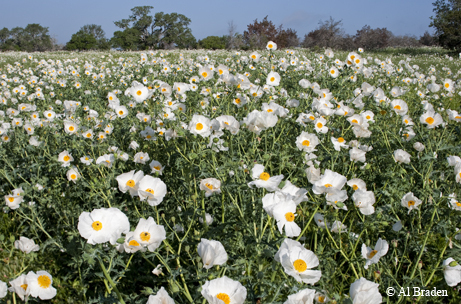 White prickly poppy is common across the southeastern United States, forming large colonies in pastures and disturbed areas with sandy or gravelly soils. Flowers may appear as early as March, and can be seen as late as May or June. Some botanists recognize a subspecies, A. albiflora ssp. texana, found mostly in Texas and adjacent states. We also have the rose prickly poppy (A. sanguinea), whose deep pink flowers are seen along the Rio Grande, and two yellow-flowered species, A. mexicana and A. aenea. The lavender Chisos Mountains prickly poppy (A. chisosensis) is found in far West Texas and northern Mexico. Other white-flowered species appear in different parts of the state. If it looks like a poppy on top and a thistle down below, it’s probably one of the prickly poppies. Are they useful plants or noxious weeds? Well, that depends on your point of view. Cows and other grazing animals won’t eat them. That’s a good thing, because prickly poppies are dangerous on the inside, too. Their thick yellow sap contains alkaloid compounds that are toxic to mammals. Even the small, dark seeds are to be avoided: Cases of livestock poisoning have occurred when poppy seeds were accidentally mixed with feed grains. On the other hand, these plants produce an abundance of pollen, enjoyed by native and domestic bees. Birds don’t seem to be affected by toxins in the seeds, which provide food for dove, quail and turkey. The seeds are rich in oil, so they’re a good source of concentrated energy for creatures that can eat them. The U.S. Department of Agriculture reports that oil from A. albiflora seeds was used as a fine lubricant during World War II. Many toxic plants have medicinal uses, and the poppy family is certainly no exception. Its most famous member, Papaver somniferum, is the source of opium and its derivative drugs. Prickly poppies don’t contain opium, but Native Americans found many uses for the alkaloids in that yellow sap. Preparations made from different prickly poppy species have been used to treat skin disorders, eye problems, headaches, toothaches, digestive trouble, coughs, colds and insomnia. Unless there’s a skilled herbalist in the family, it is not recommended to try these remedies at home. For most of us, the best thing to do with prickly poppies is keep a safe distance and admire the blooms.